This site introduces an advanced Buddhist spiritual practice called the Bodhi-Tree meditation. The Bodhi-Tree (or wisdom-tree) is a set of four distinct Buddhist meditations. Each meditation is based on an insight that the historical Buddha was said to have experienced as he sat under the Bodhi-Tree more than twenty-four centuries ago. According to Buddhist tradition, the hours before the Buddha's enlightenment were divided into four watches or periods of the night. During each watch, the Buddha experienced a specific set of insights or revelations. During the last watch, as the morning star appeared on the horizon at dawn, the Buddha entered Nirvana. Many modern Buddhist lineages have not emphasized the importance of these stages as the pattern that the Buddha followed to reach liberation. However, his stages of liberation are an example for all who seek liberation, and in the past, there have been important teachings based on these stages that have been lost. A brief summary of the insights of the Buddha during the four watches of the night follows. These insights will be correlated with the different practices of the Bodhi-Tree meditation as we proceed with the explanation of the practice. The Bodhi-Tree or wisdom-tree is a sacred symbol in Buddhism for a number of reasons. It represents the place of the Buddha's enlightenment, and is therefore sacred geographically. It is ancient. Thus, it is sacred temporally. It represents growth towards liberation. Therefore, it is sacred developmentally. It was said to rain blossoms. Though these were said to represent the blessings of celestial buddhas and devas, they also symbolically represented the tree as being sacred aesthetically. In all these cases, the Bodhi-Tree's symbolism gives access to the Dharmakaya, which is the most transcendent aspect of Buddhism. However, this access is not based on simple awareness. The access to the Dharmakaya comes via the Sambhogakaya, the pathways through the intermediate worlds of Mahayana and Vajrayana Buddhism, which have been mostly lost and forgotten. 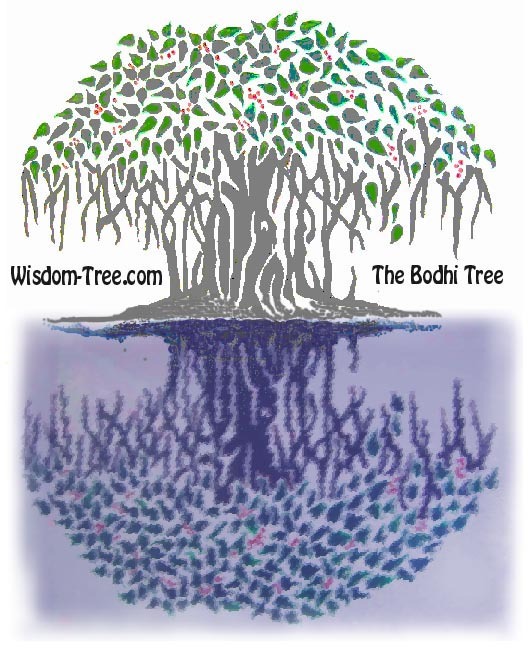 In order to better understand the Bodhi-Tree meditation, we will next discuss its symbolism in greater detail. Please click on the [ NEXT ] link below to continue.